Business Buddies LLC knows we all need help from time to time to do all the necessary things we have to do in life. That's why we are here to help you with our many affordable services and products. We are a Michigan based company. 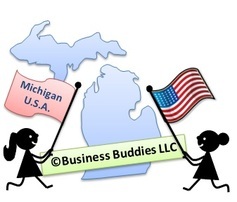 All products are original and exclusive designs made and sold by Business Buddies LLC. All designs are copyrighted by Business Buddies LLC and may not be reproduced in any way. You may phone us at (313) 375-1846 to place orders on all products, Monday-Friday, 9:30 am-4:00 pm (Eastern). You may also order our Business Thank You cards online 24/7, unless you wish to have them personalized.